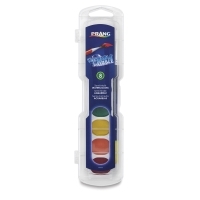 Prang Washable Watercolors are easy to cleanup from skin and clothes — they're great for early childhood learning or younger students. 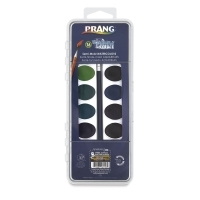 The sets feature brilliant colors that dry transparent and rehydrate immediately. The semi-moist watercolors are packaged in durable plastic cases, and new pans hold 41% more paint. Each set comes with its own brush with an easy-to-grip wood handle. 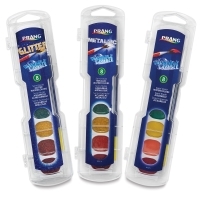 Prang Washable Watercolors are available in 8-Color and 16-Color sets of classic colors, and in Glitter and Metallic sets. For set colors, see the Item Specs tab. 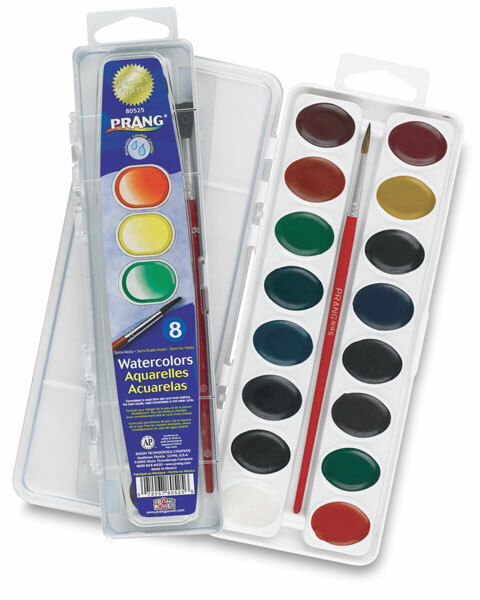 Washable Watercolor Class Pack — This set includes 36, 8-color sets of Washable Watercolor in assorted styles: 12 Classic sets, 12 Glitter sets, and 12 Metallic sets. 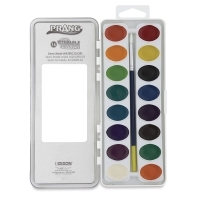 Classic 8-Color: Red, Orange, Yellow, Green, Blue, Violet, Brown, and Black. Classic 16-Color: Red, Orange, Yellow, Green, Blue, Violet, Brown, Black, White, Red-Violet, Blue-Violet, Light Blue, Turquoise, Yellow-Green, Yellow-Orange, and Red-Orange. Glitter 8-Color: Red, Orange, Yellow, Green, Blue, Violet, Silver, and Gold. 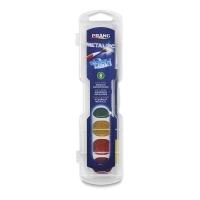 Metallic 8-Color: Red, Orange, Yellow, Green, Blue, Copper, Silver, and Gold.